I was really looking forward to reading John Freely’s scientific biography of Copernicus as the man who put the sun where it belongs is someone who tends to only receive a couple of pages of aside before we get onto the meaty stuff. I knew the basics, but I wanted to know about Copernicus the man, and to discover more about his work that the concept of a heliocentric universe. The Second Peace of Thorn in 1466 had removed Warmia from the control of the Teutonic Knights and placed it under the sovereignty of the Polish Crown as part of the province of Royal Prussia, although with special privileges that gave it some degree of autonomy under its bishop. The following year the cathedral chapter of Warmia elected Nicolaus von Tüngen as bishop, going against the wishes of King Casimir IV. The new bishop allied himself with the Teutonic Knights and King Matthias Corvinus of Hungary. This led to a conflict known as the War of the Priests, which began in 1478 when the army of the Polish Crown invaded Warmia putting the town of Braunsberg under siege. The town withstood the siege and the war ended the following year with the Treaty of Piotrkow Trybunalski. That isn’t even the whole paragraph. It is just plonking down facts – no narrative, no link to Copernicus or his work. Even when we get a chapter of historical background Ancient Greek models of the universe, we just get a long list of ‘This philosopher thought this. Another philosopher thought that.’ Without doubt, this reviewer was losing the will to live by page 35. Later on things got slightly better as we spent more time on Copernicus and his work. Again, though, there did tend to be a heavy duty concentration on putting the facts across without any great literary flair. Even so, in this part it does the job. Interestingly, the sections that cover Copernicus’s life and work outside of his astronomy are more lively and readable than the parts that should be the core of the book. Copernicus himself is out of the way by page 160, but we trudge on to page 249, with a detailed analysis of De revolutionibus, then chapters that take us all the way through to Newton, which seemed perhaps a little too far removed from the supposed subject matter. 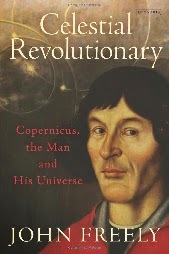 This is a very useful and detailed book if, say, you are doing some academic research for which a knowledge of exactly what Copernicus got up to in his work would be useful, but it really isn’t the popular account that it was sold to me as by the publisher. The front paper promises to tell us about the ‘epic, thrilling times in which [Copernicus] lived’, but I am afraid that for me, that thrill was sadly lacking.